Place the ground beef, egg, red onion, parsley and breadcrumbs in a mixing bowl. Add the salt, oregano, cumin and black pepper and combine well. Form the beef mixture into 1-1/4 inch meatballs (makes about 1 dozen) and arrange them on the prepared baking pan. Bake just until browned on the outside, 8 to 10 minutes. While the meatballs bake, make the sauce. Heat the olive oil in a large skillet over medium heat. Add the red onion and sauté until softened, 4 to 5 minutes. Add the garlic and continue cooking until softened, about 2 minutes longer. Stir in the tomatoes, oregano and cumin and cook for 5 minutes, then season to taste with salt and pepper. Add the meatballs, reduce the heat to medium-low, cover and continue cooking for 20 minutes, stirring occasionally. 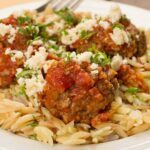 To finish the dish, divide the orzo between 4 plates, top with meatballs and spoon some sauce over each portion. Sprinkle with crumbled feta cheese and fresh parsley and serve immediately. Heat 2 tablespoons olive oil in a large (preferably nonstick) skillet over medium heat. Add 8 ounces of dry orzo and stir until thoroughly coated with the oil. Continue cooking, stirring frequently, until a good portion of the orzo is lightly toasted, 4 to 5 minutes. Stir in 1-1/2 cups of water or low-sodium chicken broth. Cover, reduce the heat slightly and cook, stirring occasionally, until the liquid is absorbed, 3 to 5 minutes. Although it will most likely still be too firm, check the orzo for doneness. Add another 1/4 to 1/3 cup of liquid, cover and cook until the liquid is absorbed again, 1 to 2 minutes longer. Repeat the process, adding liquid in 1/4 cup increments until the orzo is al dente. Transfer to a bowl and set aside.